Not too long ago, a cyclist was killed a little more than a mile from my home. Although we had not been members of FLCC for very long, I thought FLCC could be the perfect organization to address the road conditions leading up to the event. A few FLCC members met with the local highway department and offered the cyclist's viewpoint. Since that time, joined by Bike Walk Tompkins and the Ithaca-Tompkins County Transportation Council, a regular dialogue began with government authorities. As we met and exchanged emails, our working group identified a series of roads which cyclists frequented and found wanting. As a result, Tompkins County Roads Department, which maintains the roads most FLCC members ride on, made paving and repairing these roads and shoulders a priority. Even though the segment of Warren Road from Hanshaw Road to the Golf Course was not on their original budget, we have been pleased with their response. 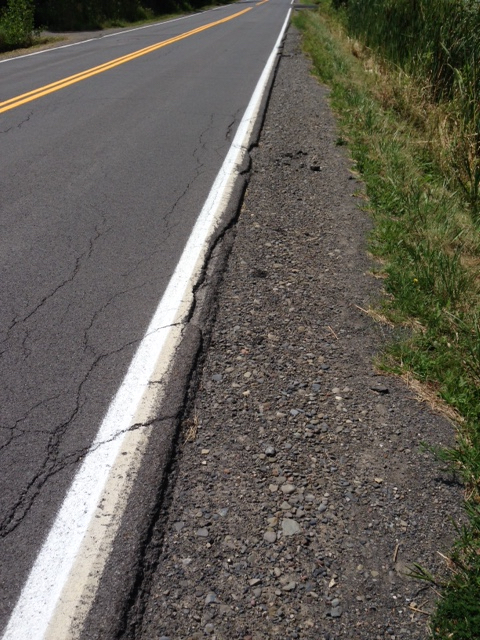 The shoulder before was crumbling, with a dangerous transition to the road surface. After paving, riding on a now hard surfaced and widened pavement gave commuting cyclists to Cornell and points south, as well as pedestrians a much improved sense of safety and distance from the passing cars. The FLCC Advocacy Committee seeks to improve the riding experience throughout the County through signage and making riding safe for everyone, and often works in coordination with Bike Walk Tompkins on advocacy and other joint efforts. We are always seeking members to expand our activities to include improving motorist's behavior around bikes on the road and promote cycling safety within our community. Email Bill Shang if interested. 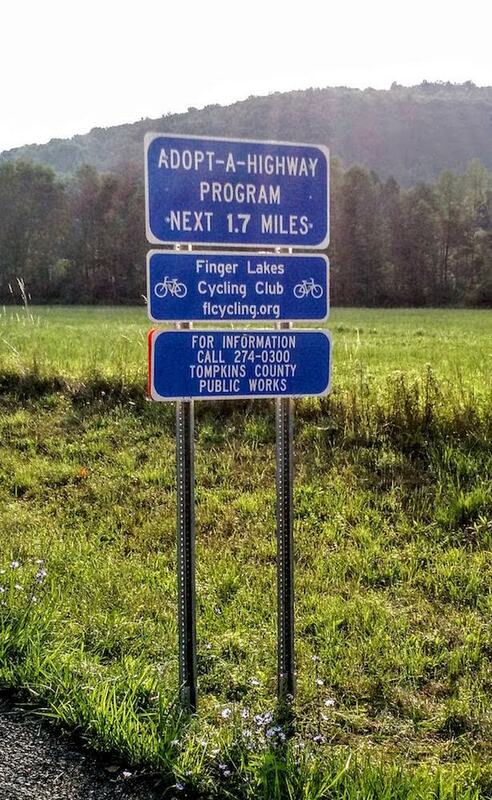 Starting in the fall of 2016, the FLCC began partnering with the Tompkins County Highway Department in their Adopt-a-Highway Program. The club maintains two sections of county highways: Ringwood Rd. (between Ellis Hollow Creek Rd. and 553 Ringwood Rd. ); and Midline between Ringwood and Irish Settlement roads, starting August 1. Armin Heurich coordinates the cleanup events, which typically happen on a Sunday in October and April. This is a great opportunity to clean up some of our favorite stretches of road in the county and build good will in the community. Volunteering is only a modest investment of time, usually two to three hours, and volunteers work in teams of two or three. Register here if you are interested in participating. The spring 2018 cleanup is scheduled for Sunday, April 15 from 9 am to noon. The FLCC began a partnership with DSP Shows and Dan Smalls to manage bike valet parking at the Cayuga Sound Festival, which was first held in September, 2017 at Stewart Park in Ithaca. This event proved to be very popular with thousands of people attending, and the FLCC had the opportunity to promote transportation alternatives and the club's activities to a many people. Donations from over one hundred happy customers have been earmarked for FLCC advocacy initiatives to the tune of over $500, and we look forward to offering this service again next year. If you are interested in volunteering for this event, please contact Armin Heurich. Ithaca hosts some great festivals, and this is an opportunity meet and greet folks who might be interested in the FLCC. 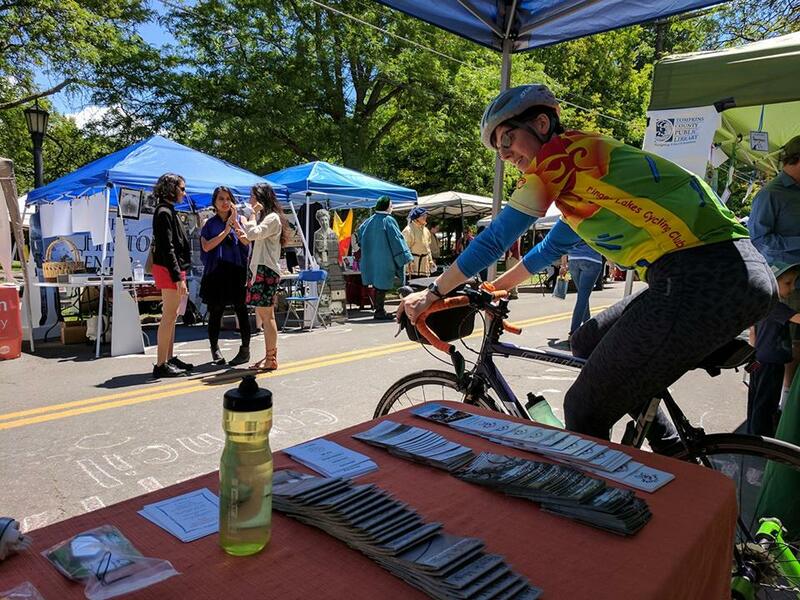 We table at the Bike Walk Tompkins "StreetsAlive" festival on Cayuga Street (early May) the Ithaca Festival on the Ithaca Commons (early June), and the Cayuga Sound Festival in Stewart Park (late September), and are open to more. Tabling is a great opportunity to talk with people about all things cycling, whether they live in the Ithaca area or just passing through. It's also a chance to encourage new (or returning) cyclists and welcome new club members. On the table, we share information about the benefits of club membership, give away free local bike maps and sell club merchandise, such as club jerseys, jackets, bike mirrors and bells. Setting up a bike trainer adds visibility to our efforts, and lets us put in a few miles while chatting with folks. Volunteering usually means taking an hour or two at the table. Volunteers work in teams of two. Please contact Armin Heurich if you are interested in tabling. The FLCC keeps tabs on transportation infrastructure projects and proposals that would have an impact on cyclists. We will alert you when important projects in Ithaca, such as the MLK St. Corridor improvement plan and the University Ave. improvement plan, are up for consideration, and we will make sure that FLCC representatives will be in attendance at Board of Public Works meetings, Common Council meetings, and any relevant Tompkins County Legislature meetings. Let's work together to promote a more bicycle-friendly region!